Get ready for more teacher training, more technology, and perhaps more resources for early intervention programs as school districts start to get their hands on the $12.2 billion allocated by the federal government for special education stimulus funds. There are still a lot of unresolved questions, superintendents told me for a story I wrote this week. (Story here.) Though we in Washington have focused on the U.S. Department of Education, superintendents don't work directly with the federal government on issues like these. The state departments of education are the entities that monitor district compliance and program quality, and the districts aren't going to make a move without knowing that they're using the money in a way that won't prompt a big audit later. But even with those uncertainties, the superintendents I talked to offered some broad outlines of how they'd like to spend the money. The federal government has indicated that it's better to spend stimulus dollars on "short-term investments that have the potential for long-term benefits, rather than for expenditures the LEAs may not be able to sustain once the recovery funds are expended." So that means paying for things like professional development in response to intervention, improved data systems, or possibly even building renovations and expansions if districts receive a special waiver from the Education Department. What the money shouldn't be spent on, generally, is new teachers and brand-new programs, unless the district is sure it'll be able to pay for the program when the federal money is gone. It's an exciting opportunity, superintendents said, but the stimulus dollars may come too late for some of them to halt layoffs in some cash-strapped areas. As Bruce Hunter with the American Association of School Administrators told me, "the problem is just bigger than anyone thought it was going to be." State superintendents would be wise to use their state's latest Annual Performance Report (APR) as a guide for determining how best to spend the IDEA stimulus funds. This new system of performance targets on key indicators and annual reports on how each state is doing against those targets was established by IDEA 2004. Each year the US Dept. of Ed gives out a "determination" rating for each state based on its APR. 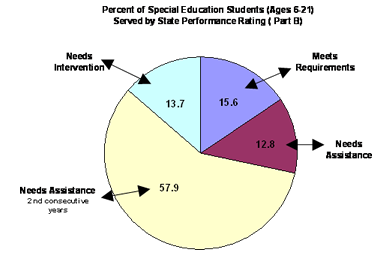 Based on the rating of 2008, only 15% of the nation's special education students are being educated in states that received a rating of "meets requirements" while more than half of all students are educated in states that have earned a "needs assistance" rating for two consecutive years. (see http://www.advocacyinstitute.org/images/SpedPopby08APRrating.png for the full breakdown). While professional development might be a quick and easy way to spend IDEA stimulus funds, the results of such activities should be measurable -- and targeted to improving the state's problem spots in the last APR -- many of which are graduation rate, dropout rate, and proficiency rate on state assessments.